Our article is devoted to parents who take care of esthetic education of the beloved child, besides his general education. Sometimes it isn't so simple to mothers and fathers to choose the direction of cultural education of the child. We will try to orient dear parents towards dance direction; namely, we will tell about the benefits of Irish dance for children. 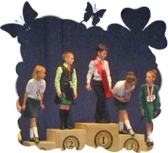 Irish dancers sometimes don't love a question – for what they love their hobby because it is difficult to answer accurately. You can simply love Irish dance, or the dancer looks for any benefit: satisfies ambitions, get a profession or simply advantage for an organism, doing the free time more interesting. The question of a choice of hobby is open for immature children's minds and young generation almost constantly: the teenager looks for and tries and small children are helped by parents – on the personal taste or being guided by a certain therapeutic component of hobby for the child. 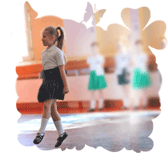 The Irish dances can not only bring pleasure, but also benefit to a growing organism. We already mentioned it in one of articles about therapy by dance, but we will focus on all aspects in more detail. As many people know, Irish dances are executed, being extended exactly up, shoulders are straightened and fixed. Such position of the body remains invariable throughout all dances if it is a question of traditional execution. It allows to strengthen muscles of a back and to create the correct posture. That is the child grows with a straight back that helps in turn to development of a healthy spine. 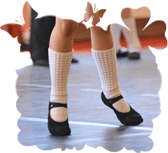 All know that Irish dances form the correct and beautiful relief of feet at any age because the main load falls on feet. For children it is important because the organism will grow for a long time. Legs get stronger, become strong with the developed and tightened muscles. 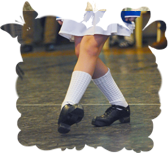 In strict traditional Irish dance the dancer`s feet are on the extended tiptoe, heels are stretched-out, and they should stay in this position always. Such trainings of turnout rule out the development of the "clubfoot", the child grows with the correct gait, with beautiful instep. Moreover, continuous trainings on the stretched-out tiptoe - strengthen feet and their ligament, it means that the risk of trauma reduces. Plus to it, training of instep promotes prevention of longitudinal platypodia. transverse platypodia in this case can also be avoided, paying much attention to child`s footwear. 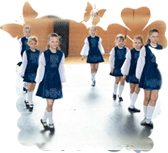 Irish dance develop static sense by the child and strengthen a vestibular apparatus: owing to tiptoe, to extended position of the body, and also to many movement and circular rotations at schemes of dance. The children in the solo dance develop correct motor coordination, because children during the execution need to control many organs: back, shoulders, neck, legs, and feet. Group dances learn more coordination of all organisms as a whole: here we carry out many schemes with use of hands; we remember many difficult schemes of movement. All this is useful for training of the child`s general motor function (jumps, turns, movements and schemes with hands) and for the best formation of all organ`s motor function. Besides, side vision develops as it is always necessary to control movement of the partner if the speech about Ceili or figure production, or simply of other dancer nearby if the speech about solo dances. The Irish dances are well-known for the beautiful melodies and rhythmic drawings which need to kept even in soft footwear dances without use of a sound of heels. Each dance has its own rhythm and child in the classroom learns and develops, so-called, sense of rhythm and musical ear, even if the child was not born with such talents. And then, practically all children love cheerful fast music, and always wish to dance! The Irish dances, as well as possible, give also such opportunity which promotes always good mood. And, the main thing, it is formed emotional and esthetic perception of world around through music and movement. Speaking about general use, the Irish dances give the chance to children to plunge into other culture, and not only into the Irish culture. Thanks to numerous competitions which take place already worldwide, the child since the childhood can visit many corners, of both our immense country, and of other countries. All classes are held in groups, so kids learn sociability. 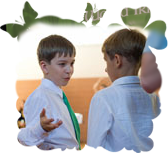 "Feeling of comradeship" is imparted to children that develops in the classroom for the study of the ceili (group dances), where team spirit is a very important component. And the child learns to do the trick, seek to be the best, talking about solo dances. Certainly, analysis and learning of dancing schemes develops very well memory and the general quick-wittedness that is important for general educational upbringing, considering the difficult school program. Dances are also a simply opportunity to move actively, the opportunity to send never-ending energy of the child to the useful course. Dances will help to have a rest from infinite school tasks and work at the computer, will distract from possible computer dependence or from a game addiction. The child, being in a circle of contemporaries, receives personal contact, gets friends in real, instead of the virtual world. 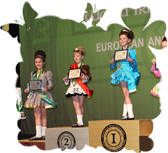 There is an excellent opportunity to win not against "the fictional enemy» but the real rival and "in honest fight" - at the Irish Dance Competitions. The child can be relieved from possible complexes and become freer in communication with other children, as well as to learn how to communicate with adults. In addition, it should be noted that the Irish dances are visually very beautiful that is very important for small children and their parents. The girl moves gracefully. She is dressed as the little fairy and has straight back and the slender extended legs. The boy is slender and fit as a tin soldier, and looks like a little lord. Certainly, it is necessary to work a little bit to have opportunity to dance in a beautiful dress with ringlets and a crown as at the princess for the girl, and for the boy in an elegant jacket. But the child on a podium with a commendation ribbon on a breast and a cup in hands always pleases parents. And the main thing, the child is infinitely glad to the medal or to other prize and that his efforts are estimated wholly. Parents always have a reason to make a brilliant display of "honour roll" of their child in the society of family and friends. 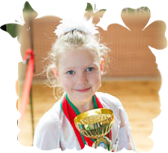 After all, with a serious attitude to training a child can get excellent prospects in the field of dance art, namely: participation and victory in international competitions. At least - there is always a chance of a victory in solo or team competitions and at most - there is a perspective opportunity to receive a title of the Champion. 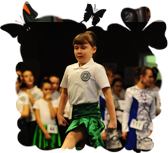 The Irish dances give real chances and professional growth: in the future the child can receive a profession: the certified teacher or the international judge. Dear parents, besides the good of Irish dance for your children, you have time to have a rest while waiting for the child from a class. It is possible to go shopping, to finish the favorite novel or to finish writing a thesis, etc. And in the evening there is a chance to spend a quiet family time, because after all exercises the whole fantastic child`s energy remains in the ball-room. And also you can always be assured that the child is busy, fully working and developing the good for the growing organism. And if you yourself are not inherent in a quiet holiday, then it`s never late to learn to dance! Do you still have your doubts? Then simply try!